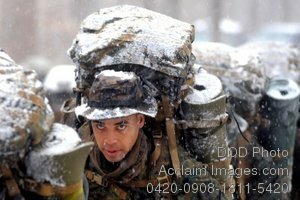 Description: Free, public domain image: Soldier, Carrying a Heavy Pack, Walking Through Snow. U.S. Marine Corps officer candidates from Charlie Company brave winter weather conditions during a four-mile hike on Marine Corps Base Quantico, Va., Jan. 27, 2009. Candidates are evaluated on their leadership abilities and problem solving skills. (U.S. Marine Corps photo by Lance Cpl. Michael V. Walters.